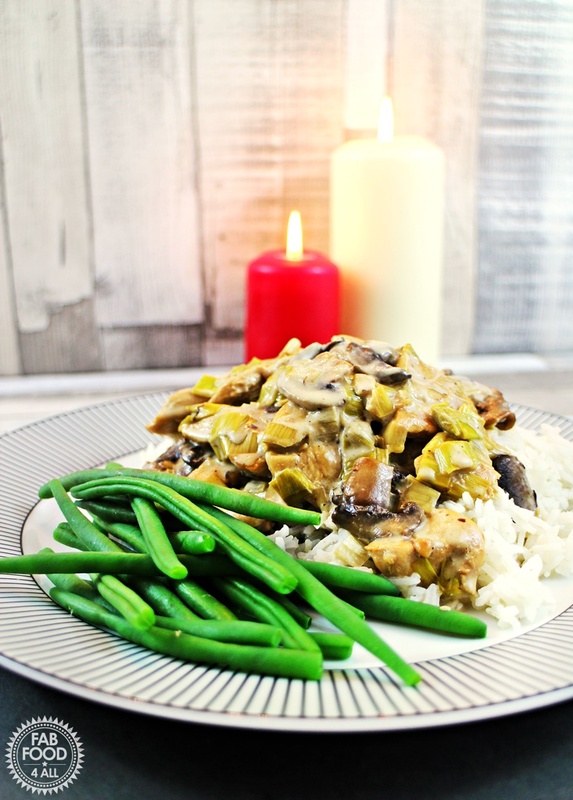 When I came up with this dish for dinner the other night I didn’t imagine what a hard time I would have naming it as it’s not exactly a short and snappy title but I settled with Chicken, Mushroom & Leeks in a Cream & White Wine Sauce because that’s exactly what it is! I’m not much of a planner when it comes to cooking, I’m more of a Ready, Steady, Cook kinda gal! So I’ll take something out of the freezer the night before (or lunch time knowing me) and have a vague idea of what I’m going to make! So the other night I had 4 chicken breasts and after a fridge raid I found mushroom, leeks, cream and white wine. “Perfect” I thought, we don’t really drink wine (apart from the odd glass of fizz on special occasions) but I do love the flavour it gives to dishes. If people have ever left wine behind after a party I fill my ice cube trays with it and use it for cooking later. This also works with cider but it’s rare that a bottle of cider would go undrunk in our house. Not that we drink very often, but I do love the taste of cider! 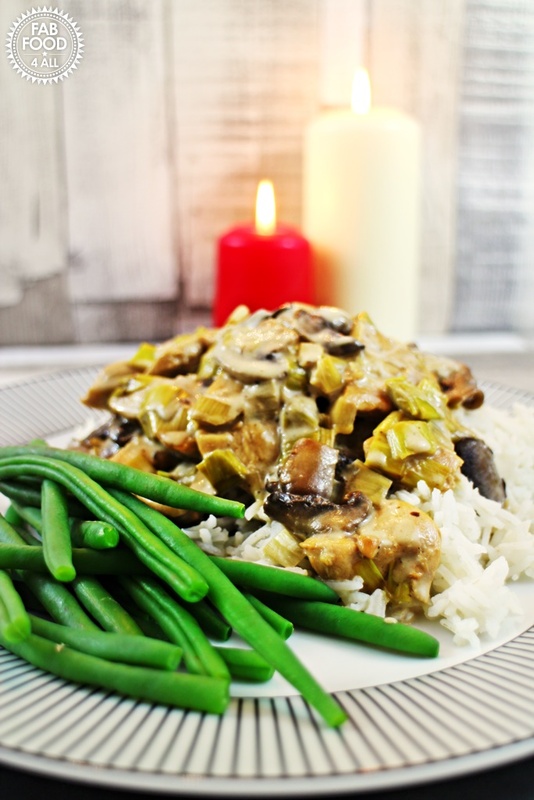 Anyway back to the Chicken, Mushroom & Leeks in a Cream & White Wine Sauce, (think I should give out prizes if anyone can remember the title LOL); my family were all very impressed and heaped praise on me for such a delicious midweek meal. Good food doesn’t have to be complicated and with just a few quality ingredients you have the makings of an excellent meal! 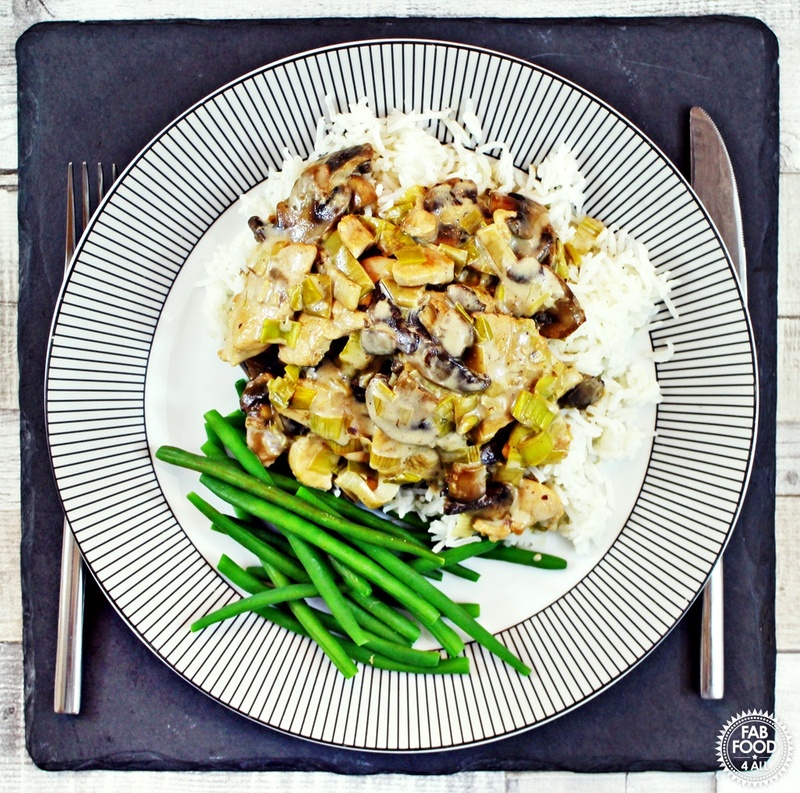 A simple but flavoursome dish Chicken, Mushroom & Leeks in a Cream & White Wine Sauce is sure to please and perfect for a mid-week meal. Heat 2 tbsp oil in large frying pan and fry the chicken (in 2 batches) until cooked through and slightly golden. Remove chicken with a slotted spoon and set aside. Add another tbsp of oil if needed and fry the leeks and mushrooms until softened. Pour in the wine and simmer for 5 minutes to reduce. Place chicken back into the pan. Then add the chicken stock and simmer for another 5 minutes. Stir in the cream and pepper and heat through until piping hot. Serve on a bed of rice with vegetables of your choice. Previous Post: « Spinach & Butternut Squash Soup – simply delicious! Can I freeze this.It is a favourite I’m my family meals . Hi Ella, I have never frozen it but there’s no reason why it wouldn’t freeze. Really nice meals. Looks delicious. oh this looks divine!! I cant wait to try this recipe out! Yummy!! 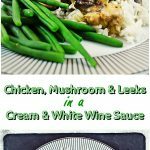 I love a white wine sauce. I bet it combines wonderfully with the stock. Great recipe, thank you! It looks absolutely perfect for a fairly quick midweek meal!